Therm-a-Rest LuxuryLite Cot Bug Shelter. 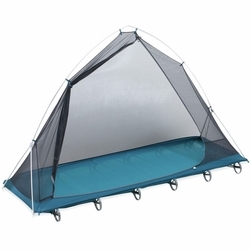 Enjoy the solitude of a night out in the open anywhere with our cot Bug Shelter. It fits snugly atop all LuxuryLite cots and its freestanding, single-pole design is a breeze to setup, ensuring a restful sleep regardless of what bugs are crawling or flying around outside.